News: Readiymate, the #iot platform for the #home and #fun use! The reaDIYmate little computer is Arduino compatible and incorporates onboard Wi-fi connectivity, MP3 player and SD storage. It also features an audio amplifier, volume potentiometer and solder less connectors compatible with SEEED Studio Grove series. Its form factor is compatible with most Arduino shields. You can build musical objects, wireless sensor gateways, fun toys and connected robots… the possibilities are endless. A set of open-source Arduino/AVR libraries specifically written for this board will be released when the first boards ship. They’ll let you easily use the onboard components to play audio, post data to the internet, download files, etc. The board also has a USB/HTTP dual bootloader: you can download your sketch from the USB interface as well as from your web server. 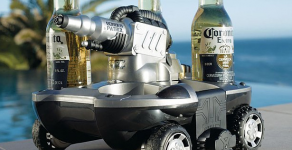 News: Amphibious Vehicle that brings your beer! Vodafone´s Power Pocket – To charge your phone while you dance!